Recent book covers. From the Yemen Times. 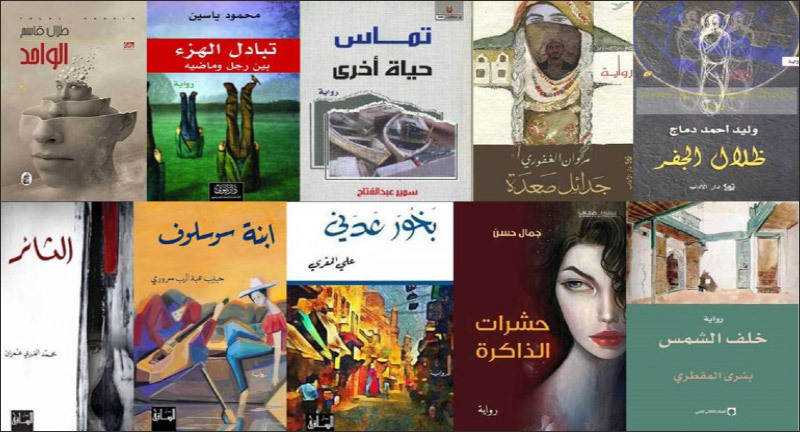 Twenty novels were published by Yemeni authors last year, and while that figure may seem insignificant in a regional or global context, it is considerably more than the eight books produced the previous year. Indeed, it is about ten percent of all the books ever published by Yemeni writers, and considering the hardships facing the country today it is an extraordinary achievement. Marwan Ghafory’s Sa’ada’s Braids, Mohammed Algharbi Amran’s The Revolutionist, and Habib Sorori’s Soslof’s Daughter are but some of the novels dealing with conflict and revolution in Yemen today, while books like Ali Al-Muqri’s Adeni Incense look further back to Aden’s cosmopolitan past. Others, like Samir Abdulfattah’s Adjacency: Another Life, or Safa’a Al-Habal’s My Destiny is a Butterfly, address one’s relationship with society and the position of more marginalized groups like women. All of these themes may be viewed through the prism of revolution and conflict, creating a social milieu that stimulates reflection and artistic creativity whatever part of the world it is happening in. Ongoing political turmoil may not bode well for Yemen, but if 2014 is any indication, the outlook for its national literary scene is a promising one. As you might expect from a troubled nation with relatively little modern literary output, there aren’t many translations of Yemeni work available in English. However, there are some, as several Yemeni authors have received regional and international acclaim. Born in 1940, Abdul-Wali’s novella, They Die Strangers, marked, in al-Homaid’s words, “the beginning of popular literature in Yemen.” It was published in translation by the University of Texas Press along with thirteen of Abdul-Wali’s short stories. Abdul-Wali also had a novel, Sana’a: Open City, selected as one of the best 105 Arabic novels of the 20th century by the Arab Writers Union. It is not available in translation. 3) Ali al-Muqri. Hurma (2012), trans. Thomas Aplin, forthcoming in October 2015. Born in 1966, al-Muqri is most celebrated for his novels Black Taste, Black Smell and The Handsome Jew, both longlisted for the International Prize for Arabic Fiction. He is also known as a champion of “minority rights.” Hurma will be al-Muqri’s first novel translated into English. 4) Wajdi al-Ahdal. A Land Without Jasmine (2008), trans. William Hutchins. Born in 1973, al-Ahdal has published short-story collections, novels, and screenplays. Some of his work was controversial, particularly his novel Mountain Boats, which forced him into temporary exile after an extremist campaign was launched against him. 5) Nadia Alkowkabani, It’s Just Love (2006). Born in 1968, Alkowkabani has published both short-story collections and novels. She came to prominence after her novel, It’s Just Love, was published by Cairo’s Dar Merit. It has not been translated in full, but you can read an excerpt translated by Kat Stapley. 6) Shawqi Shafiq, poetry, trans. Sinan Antoon. The poetic tradition in Yemen, as you might expect, is working from a much larger corpus than is the prose tradition. Shafiq was born in Aden in 1955, and is a poet and translator. “Exercises in Struggling with Loneliness,” “Allegations,” “Reasons,” and “Smoke” were published in Banipal, trans. Antoon. Previous Translating and Hate: Should the Translator Be Held Responsible for ‘Politically Problematic’ Texts? Reblogged this on RMS Creative Writing Club.